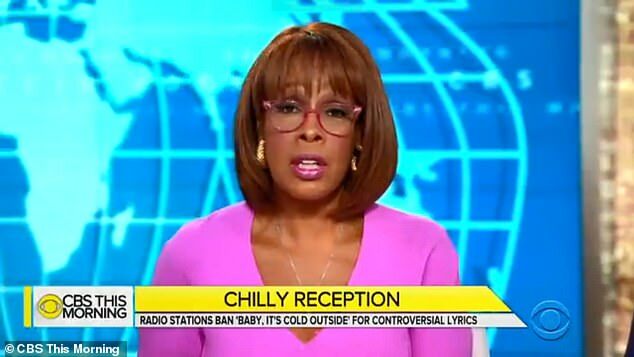 CBS host Gayle King swore live on air while defending the Christmas song 'Baby it's cold outside' which has been pulled by several radio stations. The classic holiday song is proving too controversial for some broadcasters who have decided not to play it amid concerns its lyrics are predatory towards women. King, who is a 'This Morning' the co-anchor, expressed her affinity for the duet which was penned in 1944 by Frank Loesser. She spoke out in the song's defense after a news segment on the CBS show acknowledged that song's meaning has the nation divided. 'I think you have to look at the intent of the song, and when you look at the intent, it's – to me – a very flirtatious back-and-forth between the two of them. 'I think you can look at anything and read something into it these days, and I just don't think that was the case when they wrote that song and (it's not) the intent of the song, and I think we have to look at that'. King's host disagreed with her, saying they interpreted the meaning of the song and the lyrics as menacing. King then added: 'Not me. So, we just have to agree to disagree. I just think that it's a light, flirtatious song, and she clearly doesn't seem to be so upset... keep looking at the whole [damn], the whole darn song before you make your decision'. The presenters laughed off King's swear word and the fact she became so animated over the row. She added: 'I'm so irritated by this. (It's like) people, sit down. We are losing our sense of humor nowadays, and I'm a big supporter and big proponent of the #MeToo movement, but I just don't think we have to nitpick every single little thing'. The classic holiday song "Baby, It's Cold Outside" has been banned at some radio stations after the rise of the #MeToo movement. 'I know I'm gonna get hammered for this, so let's just move along, please'. However Twitter reactions to King's sentiments appeared overwhelmingly positive. 'I don't usually agree with you Gayle King but, you hit the nail on the head this morning. 'Baby It's Cold Outside is one of my favorite songs. Part of growing up is learning how to NOT be offended by everything. We are cultivating a nation of babies,' one user wrote. 'I agree with Gayle King. We are losing our sense of humor. Keep Baby it's Cold Outside in the air! ', tweeted another. 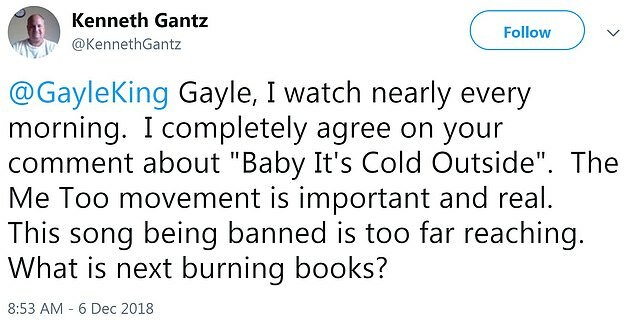 'I completely agree on your comment about 'Baby It's Cold Outside,' shared a user. Several other stations across the country -- and even in Canada -- have followed suit. Controversy over the song has existed for years but it has notched up a level this year because of the #MeToo movement. It began in the United States more than a year ago in response to accusations of sexual abuse and harassment by powerful men in the entertainment industry and other sectors. The exchanges include 'Say, what's in this drink?,' 'Baby, don't hold out' and 'I ought to say no, no, no sir...' -- lyrics that some say seem 'rapey'. Broadway songwriter Frank Loesser penned the song in 1944 and it won an Academy Award in 1950 for best original song in the film Neptune's Daughter, where it was sung by Esther Williams and Ricardo Montalban. KOIT 96.5 in San Francisco, California, has stopped playing the song until at least next Monday as they ask listeners via online poll whether it's inappropriate in 2018. The Bay Area station halted airplay temporarily after some complained about the track, but hundreds have since expressed annoyance at the idea of its removal. Meanwhile some stations in Canada won't be bringing it back at all. In November, WDOK Christmas 102.1 said it pulled the song from its around-the-clock festive music line up after receiving a call from a listener who suggested the song, written in the 1940s, contains a dated message. The #MeToo movement exploded on social media last year after accusations of sexual abuse were made public against Hollywood mogul Harvey Weinstein. Untold numbers of women have spoken up around the world about sexual harassment and mistreatment, accusing top names in entertainment, government and business and altering attitudes and the treatment of women.